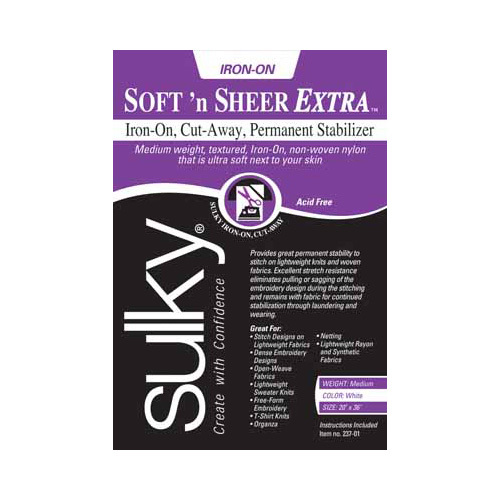 Sulky Soft ‘n Sheer Extra is 11/2 times as heavy as original Soft ‘n Sheer with the added convenience of having a fusible, iron-on coating. This time-saving, mid-weight, cut-away is the perfect choice when you want a cut-away that is a little heavier than Soft ‘n Sheer, but not as heavy as Cut-Away Plus. Iron it onto the wrong side of your fabric, using a low temperature of about 260°. This makes it perfect for more delicate fabrics that don’t like high heat. On midweight knits, use one layer of Soft ‘n Sheer Extra rather than two layers of the original Soft ‘n Sheer. And since you iron it on, fabric will not distort when it is hooped it. It is also a wonderful backing for embellishing pillow tops and as an interfacing in garments to keep them cool and light. When fleece or batting is not wanted in a quilted garment, this is the perfect alternative.